Today at work, several Jezebel staffers were discussing how they are tired of hearing about the “Hot Duck,” a.k.a. the Mandarin duck who appeared mysteriously in Central Park last month and became a viral sensation. Someone, at one point, joked about eating the duck. I found this funny, and also comforting, as I had considered what it would be like to eat such a beautiful duck. I enjoy eating animals and I do enjoy eating duck from time to time because it is delicious. And so I did wonder: did the duck’s beauty make it potentially more delicious than other ducks? But I Googled what a Mandarin duck tastes like, and it turns out it doesn’t taste good! “One factor that has helped the Mandarin duck to survive is that they taste bad; they are not hunted for food,” says the Jacksonville Zoo. “This species is not hunted for food because they taste bad,” SeaWorld echoes. “Mandarin duck in China are rather dirty feeders, often eating snails, small mice, fish spawn, etc., and consequently are well known to have an unpleasant taste,” according to author and bird enthusiast Christopher Lever. 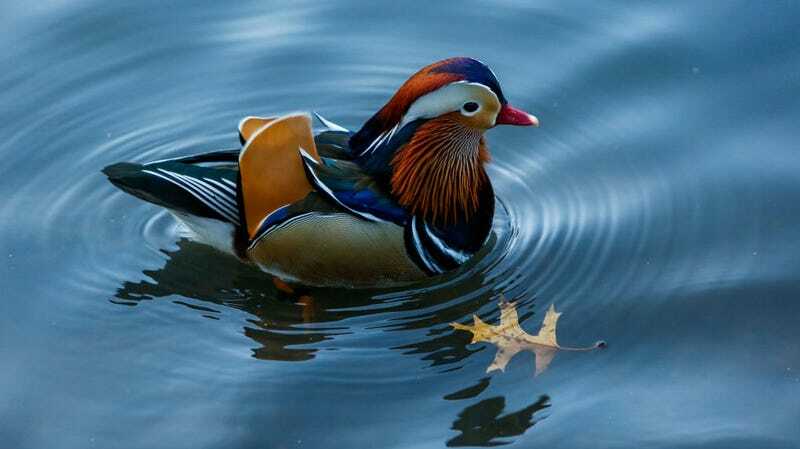 Congrats to the Mandarin duck for being gorgeous and inedible.